Libya has certainly been in the news lately. I've never visited the country and have worked on it very little, but from what I know about it (apart from my regular, and yes, facile jokes about Qadhafi) I've always found it profoundly tragic that a country can drift away like this for decades. We know so little about the horrors of the Qadhafi regime that we can't even compare it to other in the region. In this respect, and perhaps more than Saddam Hussein's Iraq, Libya appears to be the Middle East's North Korea. Here are some links and thoughts on recent reading -- this a long one, so the rest is after the jump. More to the point, it seems to me, is that the Lockerbie trial was not conducted was not satisfactorily conducted, and further investigations and testimonials suggest that the decision to point blame towards Libya was at least in part politically motivated (earlier suspects were Palestinian groups, Iran and Syria -- which may have sidelined in the context of the strategic needs of the 1990 Gulf War.) Relatives of the victims and stellar investigative reporters such as the late Paul Foot have long established the holes of in the Lockerbie case, and they have never been addressed. I would encourage you to read this post at Lenin's Tomb or purchase the special report by Paul Foot at Private Eye. When I arrived at the airport with Mr. Megrahi, there was not a single government official present. State and foreign news media were also barred from the event. If you were watching Al Jazeera, the Arabic news network, at the time the plane landed, you would have heard its correspondent complain that he was not allowed by Libyan authorities to go to the airport to cover Mr. Megrahi’s arrival. The biggest loss of al-Meghrahi's release is that it forecloses the possibility of an appeal to the first trial, which many believed was coming. Libya may have carried out Lockerbie, but it has not been proven yet. Libya, a member of the Organization of Petroleum Exporting Countries (OPEC), holds the largest proven oil reserves in Africa, followed by Nigeria and Algeria (see graph below). According to Oil and Gas Journal (OGJ), Libya had total proven oil reserves of 43.7 billion barrels as of January 2009, up from 41.5 billion barrels in 2008. About 80 percent of Libya’s proven oil reserves are located in the Sirte basin, which is responsible for 90 percent of the country’s oil output. Libya hopes to increase oil reserve estimates with incentives for additional exploration in both established oil producing areas as well as more remote parts of the country. Expansion of natural gas production remains a high priority for Libya for two main reasons. Libya aims to use natural gas instead of oil domestically for power generation, freeing up more oil for export. Second, Libya has vast natural gas reserves and is looking to increase its natural gas exports, particularly to Europe. Libya's proven natural gas reserves as of January 1, 2009 were estimated at 54.4 trillion cubic feet (Tcf ) by OGJ –but the Libyan government estimates have been cited as being more than twice that volume. Of course, now that it is back in the international fold, Libya is starting to reimpose all sorts of things on oil and gas companies -- but only if this was done with some common sense. They will also put together a book lauding Libya. The book alone will cost nearly $3 million dollars, and the people these documents say are involved in it should be ashamed. They include Lord Anthony Giddens (the sociologist behind the meaningless "Third Way" rhetoric of New Labour), Benjamin Barber (author of Jihad vs. McWorld and a longtime Libya apologist), Francis Fukuyama (he of "The End of History" and "Trust"). These and many more are listed in this document as people who visited Libya (including Nick Negroponte, Richard Perle, Bernard Lewis, David Frost etc... although a visit is of course different than writing a positive book.) I hope those allegedly involved in the book quickly distance themselves from it. • We will identify the relevant American and international publications that target the specific audiences of interest identified in the network map. Interest, Public Interest, Foreign Affairs etc. • We will identify and encourage journalists, academics and contemporary thinkers who will have interest in publishing papers and articles on Libya. During the course of the project a second important goal was introduced by the client. This goal is to introduce Muammar Qadhafi as a thinker and intellectual, independent of his more widely- known and very public persona as the Leader of the Revolution in Libya. Libya has a unique positioning in the world, driven in particular by its history of the last forty years as well as by the high profile of the Leader. Libya is in the midst of a transition from an era when stringent sanctions isolated the country. Part of the strategy for the transition towards enhanced national economic development and security involves simultaneously upgrading the world’s understanding of Libya, as well as Libya’s understanding of the world. The italics are mine -- this must be a tough client for Monitor. Puzzlingly, one of the invoices (for $617,000) contains no details but is called "Project Armani" -- could it be a reference to the above suit? More seriously, the invoice for the lobby firm the Livingstone Group is basically a fully-fleshed policy document for engaging various US institutions, establishing a relationships with USAID, visa authorities, AFRICOM, etc. It is basically a subcontracting of Libyan foreign policy to a firm that is conveniently close to the US government - assuming Muatassim even has the clout to decide such policy. Not that it matters for Livingstone, which will still get the cash. The Libyan capital has been preparing for weeks. Buildings in the centre have been whitewashed, the streets have been decked with green flags. The unlined face of a much-younger Mr Gaddafi adorns billboards, against a background of pictures of the historical figures he most admires. These include Che Guevara, Nelson Mandela and Gamal Abdel Nasser. Intended to celebrate Libya from the dawn of history to modern times under Mr Gaddafi’s ”great revolution”, Tuesday’s party will feature horses, flame dancers, military bands and lasers. To top off the event, there will be a fireworks display launched from ships off the coast of Tripoli. 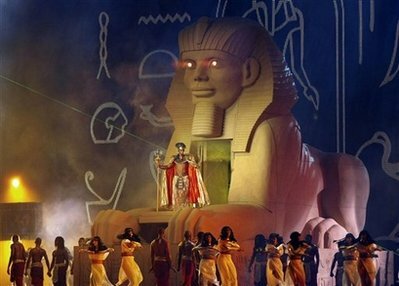 The climax will be a grand spectacle performed by hundreds of French dancers on a specially-erected open air stage in the shape of a massive tent—a symbol close to the heart of Mr Gaddafi who likes to underline his Bedouin origins. Rather amusingly, the piece also mentions that there is still a dispute on whether the Italian show planes will blow the white, green and red smoke of the tricolore or omit the red to match the jamahiriyya's flag. Is that bit about the Libyan invasion of ancient Egypt? Because that ended badly for the Libyans, as history buffs will know. Libyan leader Colonel Gaddafi is set to ask the United Nations to 'abolish' Switzerland and share the land among its neighbouring countries. The eccentric dictator has filed a motion with the U.N. saying the Alpine state should be wiped off the map and split among France, Italy and Germany. Gaddafi is set to present his bizarre plan when Libya takes over the year-long presidency of the U.N. general Assembly on September 15. For more examples of Qadhafi madness, check out our Libya archives. Tripoli nights are hot and steamy at this time of year so shops offering effective air-conditioning and high-quality goods at knockdown prices are big crowd-pullers in the hours after the iftar meal that ends the daily Ramadan fast. Marks & Spencer, on Girgash Road in the opulent west of the Libyan capital, heaves until four in the morning with women – in chadors or western dress – inspecting lingerie and swimwear watched by irritable husbands and children expecting presents for the Eid. "Last chance to buy," say the Arabic signs above neat fitting rooms in that familiar green and white trim. No returns are allowed during the sale. The spanking new branch of BHS nearby is so busy that customers triple-park outside. Monsoon is doing well too. But there is more to this story than underpants or skirts at 60% off and the slightly weird transportation of the high streets of middle England to this sweltering north African city. Well, it works everywhere else, so why not. But did Qadhafi really need to take all this time to get to this -- the shallow reward of a M&S (and I love their cookies as much as anyone) and a fancy dance show? 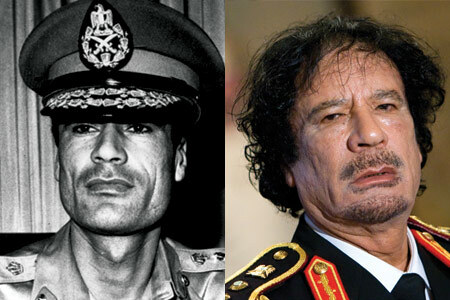 Mr Qaddafi is reaping rewards for his reformed behaviour at home too. Tripoli, Libya’s capital, is sprouting fancy new hotels, as well as a new airport, to welcome an influx of would-be investors and tourists. Literacy is now nearly universal among schoolchildren. Life expectancy has gone up by 20 years, and infant mortality has fallen to less than a tenth of the level it was at the time of the revolution. Yet such gains ought to be unremarkable for a country that exports nearly as much oil, per head, as Saudi Arabia: a total of $46 billion-worth last year, divided among just 6m people. In fact, Libya trails far behind other oil-rich states by many measures, and not just in the contrast between Tripoli’s garbage-strewn thoroughfares and the gleaming Miami-scapes of the Gulf. As any Libyan who recalls the days before Mr Qaddafi’s revolution can attest, this is a country where something has gone very wrong. Things are not so bad as in the dark days of the 1980s, when the Great Leader experimented with ruinous social theories and had dissidents hunted and shot. Yet while Libya’s peculiar form of socialism still brings free education and health care, along with subsidised housing and transport, trade unions remain banned, along with nearly every kind of independent social organisation. Salaries are extremely low, thus keeping Libyans cash-poor even as billions stack up in foreign reserves, or in the pockets of a narrow band of regime insiders. A lack of jobs outside the government has led to youth unemployment of perhaps 30% or more (all statistics in Libya are as blurry as a Saharan sandstorm). Such shortcomings reflect more than simple inefficiencies. Mr Qaddafi’s Libya is a country that has been systemically mismanaged for a generation, at virtually every level of government. Gadhafi’s Libya is everything we always dreaded we would become, as independent states, societies, governing systems and leaderships. It is hard to know where to start in listing the reasons that the 40th anniversary of Gadhafi’s rule is a hollow celebration. He and his small circle of ruling partners have managed, remarkably, to accomplish virtually every failure that can possibly be envisaged in the world of statehood and governance. The biggest failure is probably to strangle the country from within, laying siege to his own people by driving away the best and brightest Libyans, and subjecting those who remain to a life of material mediocrity and political indignity. The core of the calamity in Libya – common to the entire Arab world – is the lack of freedom for the ordinary citizen. Libya is a special case, because it combines authoritarianism with eccentricity, waste of massive wealth, and Arab and international derision. One could not agree more. ✪ Brian Ulrich on the role Libya played in the 1970s changes in the oil business. 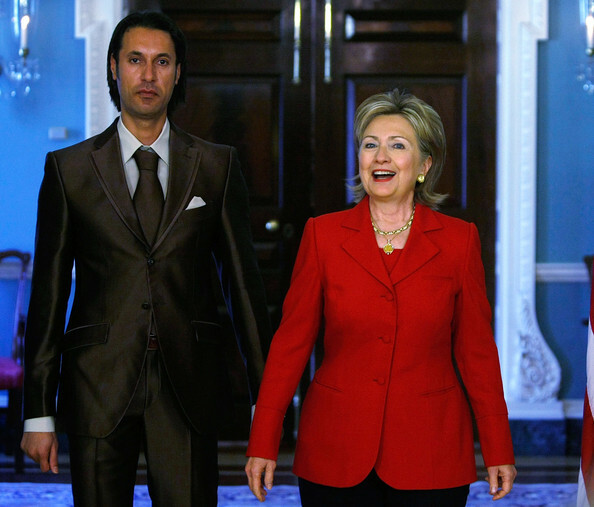 ✪ Laila Lalami on Libya's political prisoners. ✪ Ibn Kafka on the long history of murder and dire human rights situation of Libya. ✪ Bill Frelick of HRW on the rights situation and the treatment of sub-Saharan migrants.